They came after The Great Storm, the Espers. Feared and hunted by society, there are those who use their powers for good, and those who use them for evil. If there’s one thing that I could deduce from reading this book, it’s that the author is a fan of Hugh Jackman films. Namely the X-Men series and Van Helsing (which is a terrible film that I have a huge soft spot for), if he’s not, then he has unknowingly quoted one of my favourite films from the latter. This book is very much inspired by the first X-Men film, a minority of the population have super powers and are discriminated against by the wider world. Older man with a troubled past rescues teenage girl with same, takes her to a facility where Espers (*cough*mutants*cough*) are trained to control their abilities by a man known only as ‘The Professor’. Peril ensues. That’s the plot summed up there and coupled with the cheesy dialogue, I think the author is going to have to do some serious editing before I can be convinced to continue with this series. I was expecting something with a lot more sophisticated world building for something that’s advertised as Steampunk, but it left me confused at times as to whether or not this book was even set in the past or modern day. The highlight of this book for me was the variety of powers that the author described: that’s always been my favourite part in any supernatural fiction. I loved the more original spin on things that each power is based on the wielder’s personality and the emotions that they feel. This is a series with a lot of potential, as long as the writing can match the brilliance of the author’s ideas in future instalments. I love me a rag tag bunch of super heroes! Ryan Attard is the author of the Esper Files, the Legacy series, and the Pandora Chronicles. Hailing from a faraway island, it wasn’t long until Ryan began creating his own imaginary friends and writing down their adventures. 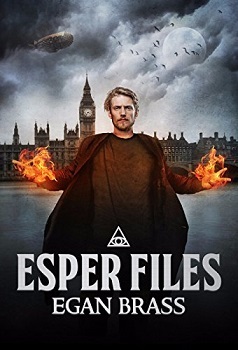 As Egan Brass, he writes the Esper Files — a tale of super-powered individuals set in a steampunk universe. He also dons a cape and a mask, and spends his free time learning Victorian insults in order to both confuse and enthrall his foes. He’s also one to write his bios in the third person.